Technically it was Lane County Circuit Judge Lauren Holland who did this, acting at Paul Weinhold’s request. 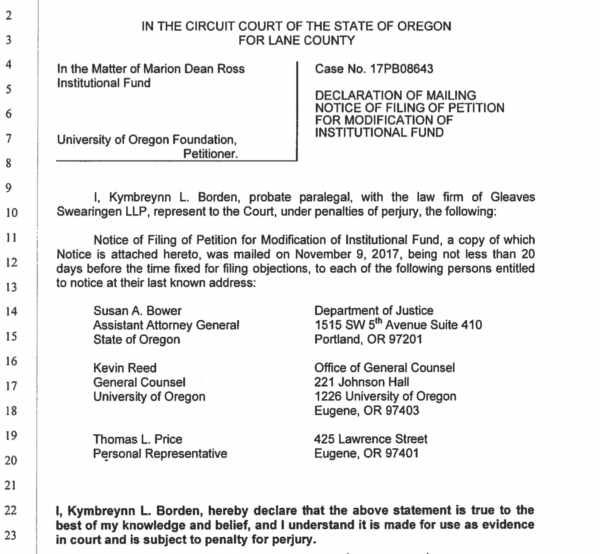 And presumably Weinhold was acting on CoD Dean Christoph Lindner‘s request, and UO General Counsel Kevin Reed went along with the money-grab because he hadn’t done his homework. Admirable and inspiring – and a lot of money. At the time the UO Foundation’s endowment totalled roughly $120M. AAA Dean Jerry Finrow and Professor Jeff Hurwit, chair of Art History, set up a MOU to govern how to disburse of the funds in accordance with Ross’s wishes. The MOU was approved by Ross’s executors and unanimously adopted by the department. Full pdf of the MOU here. [See the comments for Finrow’s view of Lindner/Reed/Weinhold modiciation]. Ross’s fund is now worth about $2.4M in 2018 dollars, and it generates $94K a year in expendable earnings, according to the Foundation’s regular 4% rule. Not that I grew up in the shadow of Jefferson’s version of the Villa Capra, copied from this very book. From what I can tell Reed wrote this without consulting the department’s faculty, the librarians, or anyone from the UO Senate. He sure as hell didn’t ask me. It’s not clear what Reed told the DOJ or Judge Laurens about the MOU, or if he’d done any due diligence to try and find out about it. This did two very different things. 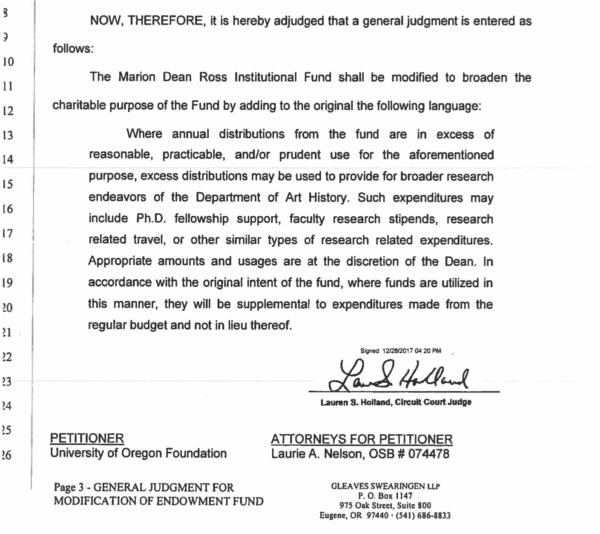 1) It gave UO permission to spend some of the Ross Fund earnings for research purposes other than books and photographs – such as grad fellowships. Great. 2) It removed all control of the spending of the fund from the department faculty and gave it to CoD Dean Lindner, without oversight. WTF? 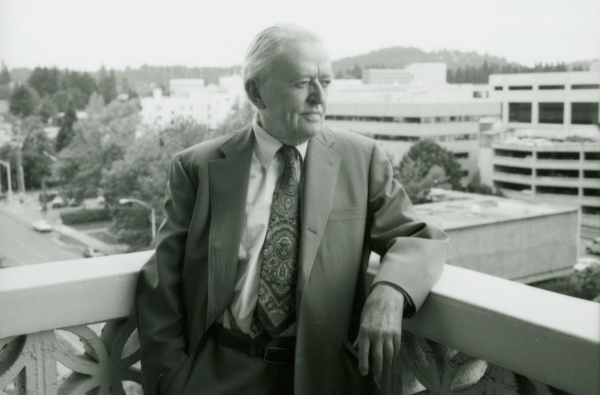 Ross was a professor who had served as a department head and as an interim dean. I think he knew exactly what he was doing when he put his money under the control of the faculty, not the dean. If changes needed to be made to prevent Professor Ross’s money from being “wasted” on books, the faculty should have been given a chance to make the changes. 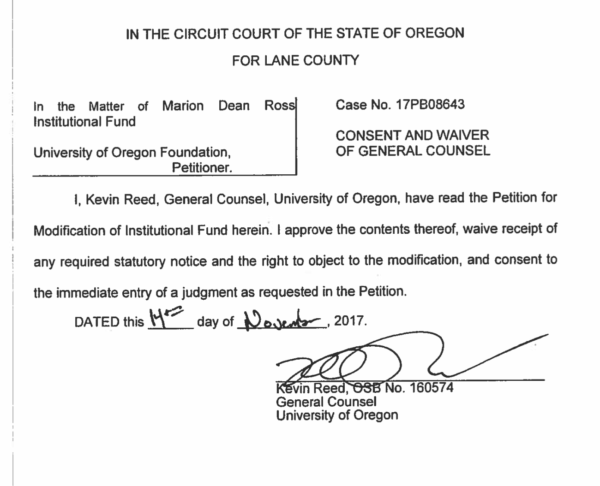 But there’s no sign the Foundation’s lawyers or UO GC Reed showed the DOJ or Judge Holland the MOU, or explained the difference between having the faculty in control and having the dean in control. I wonder how often Weinhold and Reed have been doing this sort of thing. Tagged Marion Ross Fund modification, Paul Weinhold, UO Foundation. Bookmark the permalink. Did 60% of Art History faculty vote for the proposed change? If so, great! The process was followed! If not, this is a purposeful breach of shared governance that should lead to disciplinary action for those involved. I’m hoping it’s the former. yes, I suspect that is the case. otherwise the art history faculty would have been more vocal in opposition. even so, there are plenty of examples of newly appointed administrators diverting endowment earnings toward their own pet projects and away from the use promised to the donor. Feckless and faithless. I have heard from a few Art History faculty on this, and so far not one has told me they had voted on the Ross Fund changes, or that the department had been told that their dean had a plan to make the changes. Thx umm. Did they express opposition? The primary reaction is shock. I haven’t heard of any support among the faculty but I haven’t done a census. 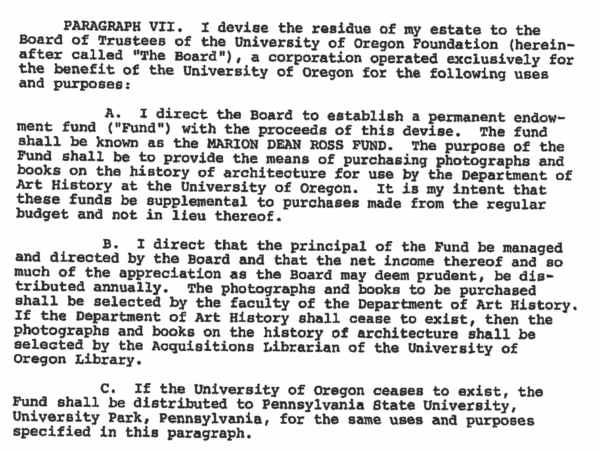 Something to think about before you give your money to UO for an endowment fund. Will they just rip you off down the line when there is nobody to protect the fulfillment of your intentions? I do have to wonder how this surplus built up. Maybe some relevant faculty will come forth to explain. I find the breach of donor intent much more troublesome than the breach of shared governance. My wife and I were ready to make a major contribution to a departmental fund to reward excellence in undergraduate research but the gift ($300,000 in stocks) arrangement floundered on the insistence of the Foundation to distribute the funds as they thought best accomplished the goals of the university. That is, I / we had no assurance that the gift would benefit the department or to reward undergraduate research. We are still thinking about our options. I encourage you to keep negotiating with Mr. Weinhold. If he can cut a deal with Howard Slusher over Hayward Field, surely he can come to terms with someone who wants to reward undergraduate research! However should he fail, please consider giving to the The UO Matters Foundation. We accept liquid assets by the bottle, case, or barrel. And we offer a firm guarantee, based on the immutable laws of rational-choice economics, that your gift will be used solely for my benefit (less any spillage). I believe if this gift went directly to the library, then undergraduate research would be supported as the library has really done a good job over the last few years promoting and showcasing undergraduate research. A second option would be the Honors College. Given the diktat potentially dismantling significant parts of the Honors College in just the next week or two (again, with almost no real input from the major faculty units so affected), I would not plan on that option being available or acceptable for a safe bequest. Has anybody asked Keith Eggener, the current Marion D. Ross Distinguished Professor of Architectural History, what he knows? The opinion on Lindner within the CoD has not been positive since he arrived. I do not think this will help. Being the dean at the time of AAA who penned this agreement, I am OUTRAGED by this move. I knew Marion Ross and he would not have approved of this at all. His intent was to support the research and stature of faculty of the department of Art History and he was very suspicious of the administration and he should be, it was his entire estate, a breathtaking gift to the University. This is fundamentally wrong and should be reversed…. Thanks for this comment, Prof Finrow. I’ve updated the post to reflect your role. Obviously the current faculty of the Department of Art History & CoD are not free to use their names without fear of retaliation – particularly now that their Dean has ~$400K to disburse to his loyalists. So it’s good to see the emiriti stepping up. I expect that Dean Lindner will soon announce in “Around the O” that he is setting up a faculty committee to oversee spending, whilst claiming that this was his intent all along. At this point he really does not have any other possible response that will not add to the embarrassment he’s given to GC Reed and CEO Weinhold, and the trouble he’s caused UO’s fundraising efforts. I wonder what Melnick has to say? Great question, because in my experience Melnick won’t speak out until he knows which is the winning side. I took a memorable course on Oregon’s historic residential architecture from Dr. Ross in 1980. If the slide projector wasn’t working correctly he would pound the podium with his cane or perhaps a stick pointer (I like the cane story better) and demand the “lantern” be fixed. I think he would have a problem with the bosses grabbing the money. Honest question, can you please explain this assertion in your story? I takeaway that once the original intended purpose of the fund’s annual distribution meets the departments needs, additional funds may be used for other purposes to benefit the department. Doesn’t seem like that big of a deal to me… But perhaps I’m missing something. No. You’re not missing anything. UOM has conveniently failed to report the fact that the process used for the last quarter century to spend these funds has resulted in an unspent surplus in the Ross Fund of $400,000. The gift modification (which was vetted with faculty) allows the CoD to continue to use the department’s current process to purchase books/photographs AND use leftover money (of which there is a considerable surplus) for student and faculty support in the department. Thanks Kevin, which faculty vetted it? Was there a department vote? Was there an effort by the new Dean to get the faculty to spend the funds according to the bequest before going to the Judge for a modification? 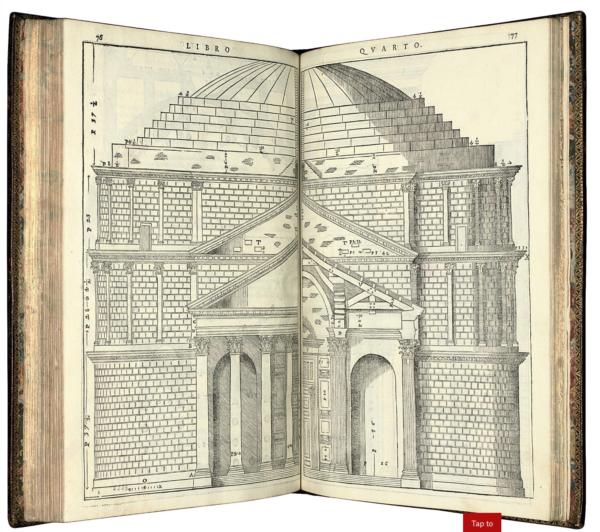 The faculty say they’d like to buy a $50K historic first edition of Palladio’s Quattro Libri. The dean says that’s wasteful, unreasonable, impracticable, and imprudent – there’s a free pdf on the internet. The dean then decides that the department will benefit from giving a research fellowship for a graduate student in what just happens to be his field, plus some summer travel money. The faculty complain to the dean. The dean says the Judge ruled he has discretion. The faculty point out that the purposes of the original gift have to be funded first. The dean says too bad, try and take it to the Judge. To be clear I am not saying that this will happen here, just that the door is now open to it and a lot of other scheming. This is not the only issue with misuse of endowment funds in COD just one that is particularly problematic, there are other examples. I have also been a donor to the School (now College) and am concerned about the long term use of our endowments. The only thing that “advancement” is interested in is getting the money in the door and there is little to no long term accountability or independent oversight of use of funds for intended purposes. It is interesting and sadly ironic that a department whose focus is history should be challenged to ignore its own. A similar thing happened in the English Department. A former member of the faculty left an endowment for a chair “in a traditional field.” For a while it was used for a traditional field; then people decided traditional fields were old hat, so now it’s used for fields that are in absolutely no sense traditional. I’m all for supporting those fields, but when someone donates a large sum of money specifically for a certain purpose, and it’s used for the *opposite* of that purpose — well, I don’t see why anyone would donate money after seeing that. I was the dean of AAA for ten years in the 1980s just prior to Jerry Finrow’s term in that position. I knew Marion Ross well and in the design of the major addition to Lawrence Hall insisted that the AAA Library be visible on the main axis approaching AAA from the south as it represented so well the whole unique group of disciplines in the School. and other departmental purposes has been irresponsibly compromised. The university administration has apparently had the uses of the this great endowment transferred to the new Dean Lindner of the re-named College of Design. This is a highly irresponsible action on the part of the university and completely compromises Prof. Ross’s specific intentions. The uses of the endowment should be immediately transferred back to the Department of the History of Art and Architecture. If not, the current action should surely compromise fund raising for the university if donors can not trust the university to follow the specific intentions agreed to in their contribution. It’s not quite as bad as you think. 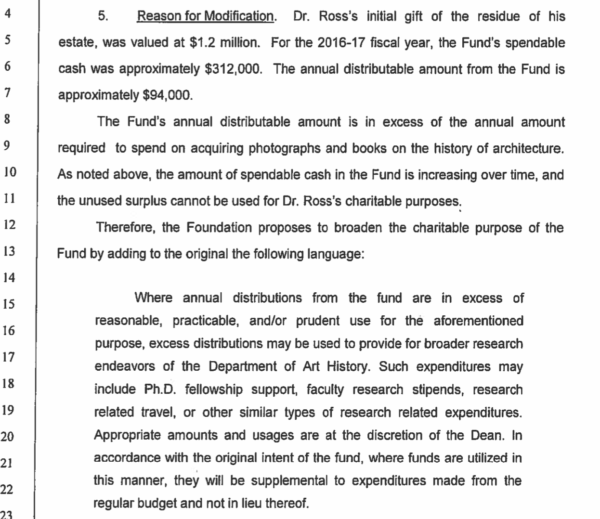 The Ross Fund still must be used to support research in the Dept of Art and Architectural History. However it can now be used for research purposes beyond what Ross intended: buying books and photographs. In addition, it’s now the Dean, not the faculty, who controls how the money will be spent.